After a little more of a break in the action than we had planned on, having hurt my back on the last day of our previous trip, Eric and I finally made it back to the property on Monday the 7th of August, and worked for a week. We found everything pretty much as we had left it. With rain in the forecast, we set up our tent right inside the Workshop Quonset, since it now had an end wall in the back, and a partial front wall as well. 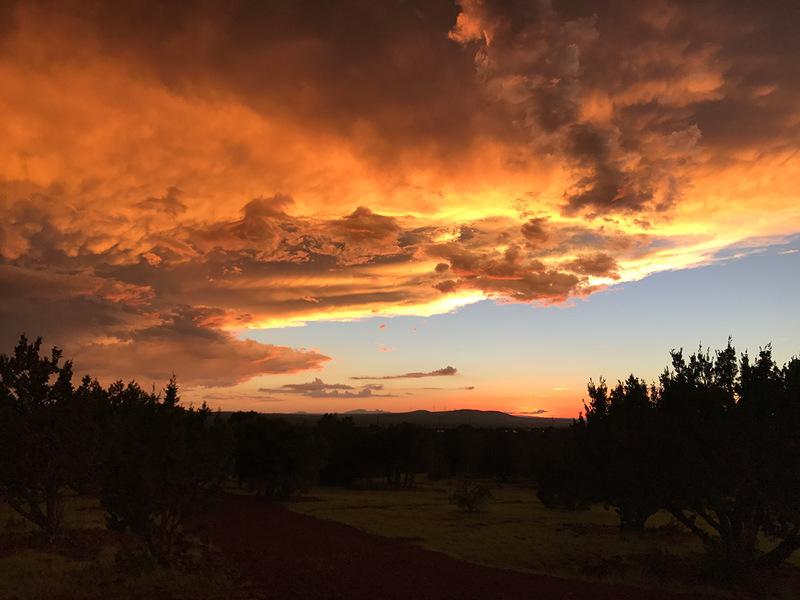 In late summer, it’s common in the afternoon and evening for monsoon rains to blow up from Mexico and cause intermittent downpours. It was great to have a real roof over our tent in time for monsoon season! Our primary task for this visit was to frame up the wood stud walls enclosing the bathroom in the Headquarters building. The plumber had more work to do to finish hooking up our cistern and pump so that we could get water pressure in the building. In order for him to finish, the wood wall framing needed to be in place. Before we could build the wood walls however, we needed to have the SteelMaster end wall put together. When it came time to stand the tall metal panels in place, we were more than a little disappointed to realize that SteelMaster cut nearly every one of our end wall panels too long. They just didn’t fit. We had to set up a cutting station with my angle grinder and cut about an inch off each one before putting it up. Apart from that, it went together relatively easily. Better too long than too short, but there was a certain amount of frustration that something that should have taken about an hour or less took much longer. Each panel had to be checked, measured, and cut. Only a couple of the smallest panels were ok to install without modification. In a way, we hated to build the end wall and block the views of our property. There’s something really great about the open-ended shell of a Quonset hut. Perhaps someday we’ll take some of the end panels back out and frame in some windows on this wall. The views out to the trees are really lovely in that spot. With the end wall up, we started the wood framing. We used coupling nuts and threaded rods to bolt the wood wall to the metal wall. Eventually we will add wood framing like this to the underside of the whole metal shell, as support for a plywood ceiling. This will allow us to insulate between the plywood ceiling and metal shell. Plus, the plywood will make a really great looking ceiling/wall surface. Working on wood framing was a fun break from the seemingly endless Quonset bolts! The monsoon rains came on schedule. One storm was particularly intense and I captured about a minute of video with my phone. The buildings didn’t leak! Later that afternoon we were rewarded with a rainbow. We were also rewarded with possibly the most dramatic sunset we had ever seen. There’s no way these photos can do justice to the sight. The clouds were slowly, constantly swirling and evolving, and it went on for at least 45 minutes. It was like a Baroque painting come to life. Another evening, the sky was steadily transforming gradation from pink to orange, with the buildings reflecting the color back in response. A jackrabbit stopped by one afternoon. We see them a lot on the property. They are timid but super charming, and they are starting to seem less afraid of the construction than they were at first. The other big building task we took on was to get one of the side window boxes installed. Here again we had trouble with the factory parts provided by SteelMaster. The windows were fabricated too wide to fit the openings in the arches. I will probably write a longer post on just this topic, so if you’re interested in more detail on the window boxes, you might leave an encouraging remark for me in the comments asking me to elaborate. We are very, very excited to have the side windows in this building, but we won’t likely be putting side windows in any more of the buildings at the Quompound. To get the window boxes to fit, we had to bend back the edge of the arch panels on either side of all six openings. These panels were 16 gauge, which is .06″ or about 1/16 of an inch thick. That’s pretty stiff and hard to bend, so I used my grinder to cut slots all along the edge. This made it possible to bend with pliers. This was tedious and time consuming, but in the end it wasn’t all that difficult to do. After we modified the opening, the box fit great! I did a little bit of night sky photography on this trip. Although this isn’t the most dramatic night sky image of the Quonsets that I’ve taken, I’m really fond of it. The glow illuminating the bolts is the rising full moon in the east. I love how the bolts glimmer in the moonlight with the Milky Way in the background. The side boxes were provided by SteelMaster as part of the basic building kit. We’re near Williams in northern AZ.